As I was writing my review of the new ChoicePlus Card from American Express I noticed some changes to the Frequent Traveler Participants of the American Express Canada Membership Rewards program. Simply put these are the frequent flyer and frequent guest programs you can transfer your Membership Rewards points to. First off, you may recall that back on August 28th I announced Etihad Guest as the newest partner of Membership Rewards but when I logged in on Sunday I noticed they were gone from the list. Turns out there are some technical issues with the transfers. Amex is currently testing their fix and the option should be back up next week..
Also gone from the list is InterContinental Hotels Group Priority Club. This second removal I'm not too surprised about as IHG Priority Club has their own credit cards in Canada now. The final change is also on the hotel side and I noticed this when I was writing the aforementioned review that 1,000 Membership Rewards points now equals 1,000 Hilton HHonors points. 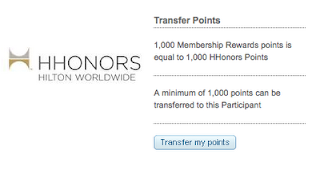 Previously 1,000 Membership Rewards points would only get you 900 HHonors points. Any increases in the amount of points you receive for transfers is always a good thing. I personally value Hilton HHonors points at about 0.75 cents each so you are getting a little more value out of your MR points although its still not a great value unless those points were earned via the 2x category bonuses on the American Express Gold Rewards Card which means you would be getting 1.5 cents per MR point. Of course the option of being able to transfer is great if you need to top off your HHonors account to get an award whether or not that Membership Rewards points cost you 50 cents or one dollar.